The concept for the debut album from Faith Eliott came about via Faith's interest in medieval bestiaries, which are illustrated compendiums of animals. Each entry in a bestiary depicts an animal and is accompanied by a meaning or a lesson that it symbolises. Impossible Bodies is based on the same framework, with each song represented by a different creature. Taken from Faith Eliott's forthcoming debut LP, Lilith paves the way into the mythological world of Impossible Bodies. According to Jewish folklore, Lilith is the first wife of Adam before Eve. The story goes that she refused to be subservient to Adam and was banished from the garden of Eden, returning later as the snake who tempted Eve. "I was inspired to write the song after a visit to a reptile petting zoo and seeing all the snakes in glass boxes. "The lyrics chronicle an explosive escape in which the snake I call Lilith breaks free from the petting zoo and spirals off into space as the world crumbles and burns behind her. "It's a song about feeling captive in an identity, specifically as a woman, but also more generally as a body." Faith Eliott (who uses the pronouns they & them) grew up in Minneapolis, and relocated with their family to Scotland aged thirteen. After moving to Edinburgh in 2006, they quickly became immersed in the city's DIY music and visual arts scene. 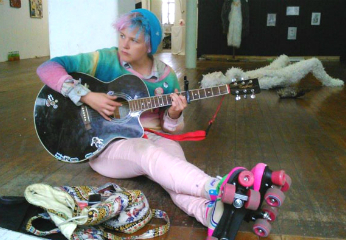 Faith pursued a variety of different visual media, including puppetry and animation until eventually attending Edinburgh College of Art to study Sculpture. During this time, Faith also sang with an assortment of different bands and alternative folk outfits, but it wasn't until graduating in 2014 that they decided to pick up the guitar and pursue their own songwriting. Faith"s first EP Insects was mostly inspired by a three month artist residency in rural Nebraska. "I am one of those people that has an innate compulsion to anthropomorphise everything in my path. "I've always made art about creatures and harboured an interest in animal folklore, natural history and suchlike. "Making an album that is based on the structure of a medieval bestiary has been an idea I've been sitting on for absolutely ages. "My parents are historians. I spent a lot of time as a kid skulking around museums and old churches. "Our house was always crammed with books and dusty academic manuscripts. "When I started listening to the Spice Girls, my dad would translate the lyrics into Latin and try to teach them back to me (to no avail, though - I regret not being more attentive now). "These days I think I find the whole aesthetic of academia weirdly comforting. "Though I didn't go down an academic path myself, there is something I really enjoy about the process of researching things and getting really immersed in a subject. "Music was never a huge part of my life when I was little, though I always loved to sing. The first gig I ever went to was Avril Lavigne when I was about 13. "After that I quickly became one of those angsty goth teenagers whose life revolved solely around the music I listened to and going to shows. My first big obsessions were bands like Placebo & Hole. "I always wrote tons of poetry and wanted to write songs, but was held back - partly by not being able to play an instrument, and partly because I built music up for myself as something I would do properly 'one day'. "It wasn't really until my mid-twenties that I bit the bullet and started borrowing my flatmates guitar. "I'm still very much a practicing visual artist. Most of what I make features a mash-up of other-worldliness, monsters and magic realism. "Being a musician has become the main way that I operate now and also hook I hang everything else from. "I pour most of my energy for making visual art into things like music videos, hand printed posters, cassette cases encrusted with googley eyes and beaded headphones. "All the different media feed back into each other one way or another. At this point it would be impossible to let anything go." Faith Eliott's track 'Lilith' is taken her forthcoming debut LP, 'Impossible Bodies'. To view the video for 'Lilith' CLICK HERE.